Satya Paul classic chiffons always get me so many compliments from strangers and passersby. This is from the collection The Royal Bloom. Chiffon sarees are really show stoppers. I have worn the same here earlier. Which look do you prefer more? See the same saree and same blouse, yet a different look. There has to be a reason why do women from royal families wear only chiffon sarees. Chiffon is a fabric known for its sheer quality, manufactured so fine, that it is transparent, airy and light. The fineness of the Chiffon Saree comes from the close placing of a number of fibres per inch in the warp (lengthwise laid out fibres) and weft (breadthwise arrangement of fibres on the warp). The weaving that then takes place in a close pattern, achieves a net that hardly allows anything to pass through. This is known as fine count. 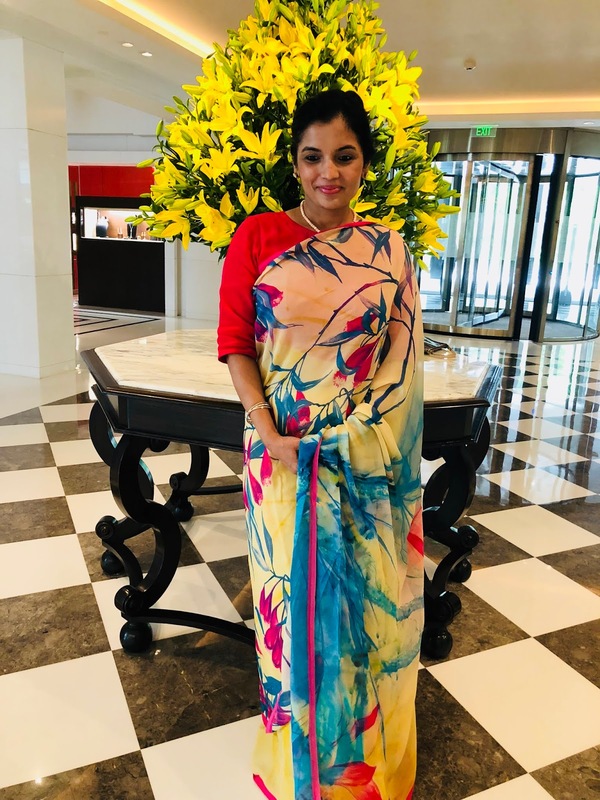 Chiffon Sarees with their extremely fine, mesh-like weaving and decorated with beautiful designs and patterns are available in most colours and shades. Chiffon saree is really majestic and feminine. The glory of chiffon fabric is known worldwide because of its versatility and easily manageable nature. Since ages, these sarees are spreading their aura. They are one of the finest creations of saree weavers which shows class, sophistication and magical charm. The reason why women from royal families wear chiffon sarees is that of its majestic look and finely woven fabric. These types of sarees are not new but have been extensively worn by women of the royal family for ages. Today, you can buy them offline and online. The best part is Chiffon sarees are a boon to women who want to be the centre of attraction in parties. There are different types of chiffon sarees that can be worn for a party occasion. These include Brasso Chiffon, printed chiffon, French chiffon and few others. One of the reasons why royal family women prefer chiffon sarees is due to the impeccable nature and comfortable fabric. These sarees are woven in beautiful designs and patterns. So you have options for different colours and shades. When it comes to Indian attire for women then the most elegant attire that comes in one's mind is saree. No other dress can enhance the look of a woman like how a saree does. Royal families are well known for their rich taste and class right from their home decor, food preference and dressing sense. Royalty is all about simplicity and elegance, and chiffon sarees provide exactly that. An amazingly light in weight fabric, you will be spellbound by seeing the options that chiffon sarees offer and how graceful they look when paired it up with an elegant blouse. That’s why they mostly preferred chiffon saree. I feel Special occasions can be made more memorable by draping a saree made from chiffon. No doubt my personal favourite is also chiffon sarees. Chiffon sarees were a trademark of Indian Maharanis, something that gave a style identity to India. Maharani Indira Devi of Cooch Behar was the first to start the trend and convert the six yards of the fabric into high fashion. Her sarees were created in the looms of Lyon in France to her specifications. Later she also introduced silk chiffon to many royal families. Indira Devi’s daughter Maharani Gayatri Devi too followed her mother’s footsteps and popularized the soft flowing chiffons. She became a style icon of her time with her natural sense of dressing and became a source of inspiration across the globe. She was even particular about how the pallu of her saree covered her head. Women from royal families wear only chiffon sarees as the fabric defines a class and allow you to make a style statement of yours. The simple attire is the right solution for every occasion as the lightweight fabric makes you look graceful along with elegant accessories. Chiffon sarees are easy to wear and very comfortable when you have to wear them for long hours. Maharanis of yesteryears epitomized fashion triggered trends and became a source of inspiration for many. Indian women may have adopted western sartorial style but it feels beautiful to get back to our roots and traditions and look as stylish, elegant, charming as our Maharanis of yesteryears. These royals chose to dress traditionally on most occasions whether attending a high tea, royal event or addressing the people. Pastel colour palette: With chiffons, do as the Maharanis did. Chiffon sarees are ideal for our climate and look best in soft pastel shades. The softness, lightness, elegant and delicate drape comes out best in colours like Dutch blue, ivory, old rose pink and citron. Even Rajmata of Jaipur had a liking for light and pastel shades and preferred turquoise and old rose pink. Long sleeve blouses: Maharanis preferred long-sleeved blouses, around 10 inches with the saree. Buttons were handmade. Minimal makeup: Go minimal with the makeup as much possible. A bright/dark shade of lipstick, a small bindi can do most of the look. Maharani Gayatri Devi mostly wore a dark shade of red lipstick. Pearls and emeralds: You can never go wrong with the classic two or three stranded pearls. Maharanis were very particular about jewellery. Classic pieces such a string of pearls or emeralds were among their favourites. In Rajmata Gayatri Devi’s autobiography A Princess Remembers, one of the three etiquettes of a maharani her grandmother told her was: “never wear emeralds with a green saree as I had, they look so much better with pink”. We suggest you pick up some vintage jewellery pieces like traditional earrings from your grandmother's wardrobe. If we talk about bangles, Ivory, Jadau and onyx were very famous. Waistcoat over blouses: Try a sleeveless waistcoat over the blouse. That is what the maharanis in the Deccan used to do. When the chiffon sarees became quite a rage in the social gatherings, it was worn with jaali, net or embossed silk waist length jackets. Some of them were even embroidered with pearl to give a rich look.